An email signature is simply the text that follows the body of an email message. For Mozilla and Thunderbird a signature file is a plain-text file. You can create one using a text editor like Notepad. You can also use HTML code in signature files. 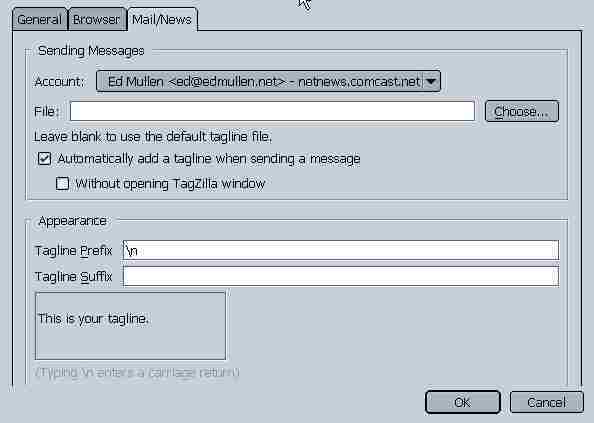 However, avoid that in most Usenet newsgroups which are generally "text-only messaging." Mozilla allows you to specify a different signature file on a per-account basis. That is, you can have a different sig for each email account, another one for newsgroups-1, a different one for ng-2, etc. The first line is the standard sig delimiter (two dashes followed by a space) "-- "
"--" without the space won't work. Do NOT include the quotation marks! The next line(s) may contain just about anything but most people include a home page link and, perhaps, some cute quote. These should really be kept to a minimum. It's a signature, you're not writing a book! For usenet newsgroups the suggestion is no more than 4 lines total. If you have, for instance, a long list of reference URLs (links) that you want to include, just put in one link which refers to a Web page containing more detailed info on all the others. Most people are not going to read through much more than a few lines in a sig. NOTE - In Mozilla there is no need to include the delimiter in your sig file, but you can. Mozilla and Thunderbird will detect the presence or absence of the delimiter, automatically add one if needed and not add an extra one. For automatic insertion of a tag line I use Pick-A-Tag (version 1.6.0b1). 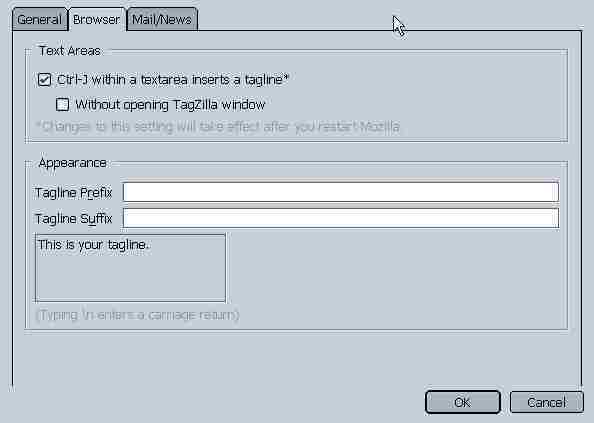 Tagzilla is a Mozilla extension (add-on program) that will automatically insert a tag line into your email/newsgroup signature(s) from a database of tag lines. A tag line is, well, a line that is "tagged onto" your signature. That is, it is the LAST line in your sig. The database of tag lines is a plain-text file containing the text you want to use for tags. Automatically insert a tag line without user intervention. This could be dangerous. For instance, when answering your friend Bob's email stating that his cat is missing, it might not be good for the utility to insert: "UnHallmark Card: My tire was thumping, I thought it was flat. When I looked at the tire I noticed your cat. Sorry!" Ahem. Like I said: "dangerous." Have the utility prompt you to select a tagline prior to insertion. This is nice because the utility selects a random tagline and gives you a choice to Insert it or not. Bob will be very grateful. My Tagline File has over 500 lines in it. Help yourself. Here's a random sample tag. Use your browser Refresh button for a new tagline. I have basic plain-text signature files specified per account in Mozilla preferences. These files do not have a CR at the end of the last line; i.e. there is no blank line at the end of my basic sig files. 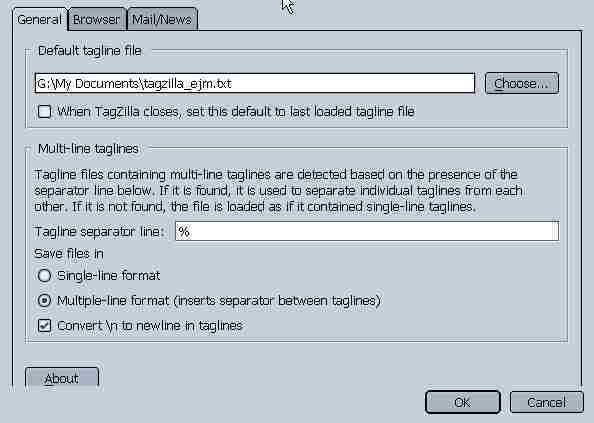 Tagzilla is used to add the last line in the sig example shown above. Getting it set up properly regarding carriage returns in the sig file, CRs in the Tagzilla text file, and the tag prefix/suffix settings in Tagzilla can be a bit confusing to say the least. Here are screen shots of my Tagzilla setup which may help you. Notice that the settings on the Mail/News tab are configurable on a per-account basis. You can have tags automatically inserted into, say, your email1 account, not your email2 account, yes on newsgroup1, etc. It's fairly easy to get Pick A Tag set up. Just point the program to the locations of the three plain-text files needed. Destination file - Pick-A-Tag takes a line from you taglines file and inserts it at the %TAG%, then it writes everything out to this Destination file. Use the Destination file in your email program as the source of your signature: Do NOT use the Source file! I keep all three files in the My Documents folder. You can set the time interval that PAT will use to create a new Destination file. NOTE: It is possible to create and use an HTML signature file. Just resist the temptation to create some very large bulky sig file. Remember, some users are still on dial-up connections and aren't going to appreciate having to wait for a lengthy download just to see that you've written to say "hi." Also, some users can't read HTML emails for various reasons.